I'm sticking in Scandinavia tonight with an early review of the 2nd full-length from Swedish doom/sludge band Throneless. 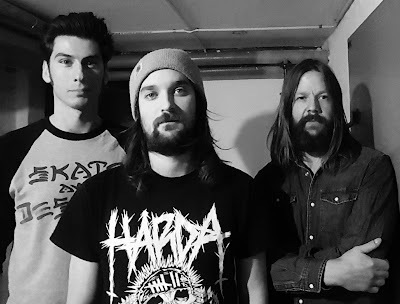 The Malmo trio released their debut self-titled album back in 2015 and now team up with UK doom/sludge label Black Bow Records to release their latest record across three formats. It's great to be featuring another new (to this blog anyway) band on here and to be hearing more of what 2018 has to offer for heavy music fans. Throneless is a band that specialises in organic doom and opener Born In Vain has a fantastically warm live-sound to it. The drums sound like they’re in the room with you, while the stoner-inspired guitar and bass add groove that backs up the hypnotically sung/shouted vocals. The mid-section is as heavy as any of the sludge scene’s current big-hitters and when the screams ring out over top of the mammoth riffs, Throneless sounds positively immense. The album’s title-track has an intro that could easily have been lifted from one of the more recent Baroness records, but that’s no barrier to appreciating Throneless on their own merits. The song soon crawls it’s way through over nine-minutes of bass-ridden sludge with a major on instrumentation. The vocals do make an appearance and are used sensitively, sitting in the mix surrounded by the music itself. “Cycles” is an album for the diehard doom/sludge fan, but that’s fine because this album will be heard by those who truly appreciate it. Senseless is another sprawling song and while it’s running time will seem positively short compared to the rest on the album, it’s still heavy as hell. You won’t be able to escape the ridiculous wall of noise that this trio creates. The best thing you can do is sit back and just stare into space as the music paints all kinds of images in your mind and in front of your eyes. Closing number Oracle is once again a song that leans more towards the instrumental end of the doom/sludge spectrum, save for the minimal use of vocal midway through. If you’re like me and you drift away listening to the music, when the vocals do come in they’re a bit of a shock but that’s just because the rest of the song is so good. 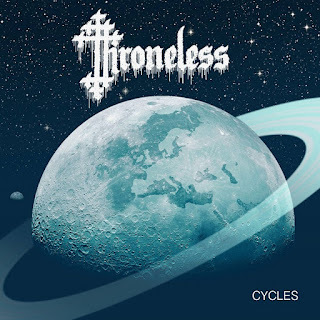 Simplicity is often looked down on in the increasingly technical metal scene that we call ours, yet Throneless has crafted and performed an album that will satisfy both sides. Heavy, mesmeric and progressive in all the right places. Awesome.